Herrera’s Port of Olympia Stormwater Treatment System recently won a National APWA Award! 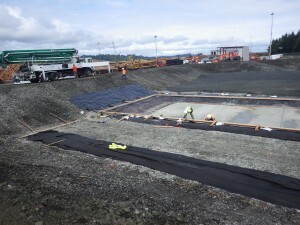 When Herrera began working with the Port of Olympia, the Port had a clear goal: design a system to treat their stormwater and make sure the system is flexible to meet the changing demands of an active Port. At the time of design there were no existing successful logyard treatments for the pollutants of concern found at this site. Herrera designed a 3.25 acre stormwater treatment facility that will meet the State’s benchmark values. Logging and logyard operations are rooted in the history of Washington State, as are the seaports the logs travel through to their worldwide destinations. Nearly 130 million board feet of logs move through the Port of Olympia’s marine terminal every year; the majority of this 65-acre site is devoted to 25-foot-high stacks of logs, log debarkers, and immense log loading machines. Every log that moves through the Port leaves behind bark and other organic material. This material accumulates and is washed into south Puget Sound where it is consumed by bacteria and in the process depletes the oxygen supply in the water. Low oxygen leads to stress and mortality of aquatic life. Due to this, Washington State’s Industrial Stormwater Permit has set benchmarks for stormwater containing oxygen-depleting material, and the Port of Olympia and many other logyards are required to treat their logyard runoff to meet these benchmarks. For the Port of Olympia where annual average rainfall is 52 inches, this means the Port must treat 64 million gallons of stormwater each year. The Port had a clear goal throughout the project: it wanted a system to treat stormwater to, or below regulatory limits, and a system flexible to meet the changing demands of an active port. At the time of design there were no existing successful logyard treatments for the pollutants of concern found at this site. The Port’s design and engineering consultant, Herrera Environmental, designed a 3.25-acre stormwater treatment facility that will meet the state permit’s benchmark values. The facility includes a three-cell system for oxidation, pH adjustment, and settling; a pod of back-flushing sandfilters; a sludge pond; sludge handling facilities; and a treatment building. The site also includes a decant pad for handling street sweeping and catch basin cleaning wastes. The site configuration is designed to accommodate future growth, and the system components are modular, to allow the system to be augmented or scaled back quickly and efficiently. An existing stormwater pond was retained as another design element allowing future polishing and or backup capacity. The treatment facility also required significant conveyance system improvements, and a new triplex pump station. The modular and adaptable design provides the Port with flexibility for reducing operating costs should their treatment needs change. 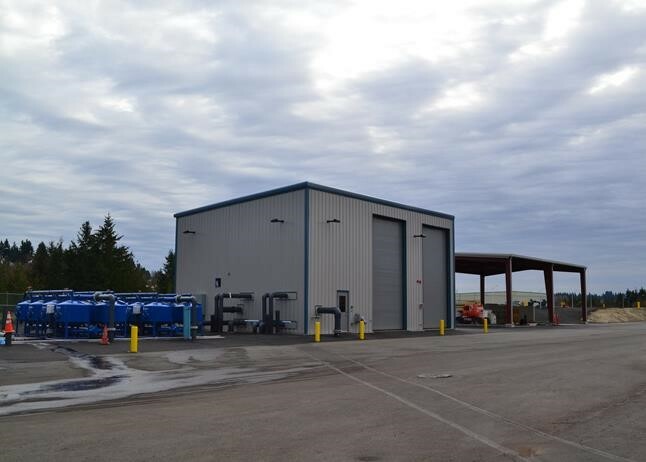 The treatment facility design successfully incorporated application of wastewater treatment technologies to treat highly variable stormwater and used relatively inexpensive pilot testing to guide the design. 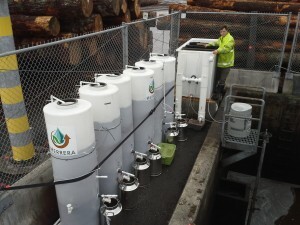 Gallon for gallon, the system will be less expensive than other technologies, including a passive treatment system the Port initially considered (and rejected), yet without the concerns of long-term reliability or consistency that came with the passive system.